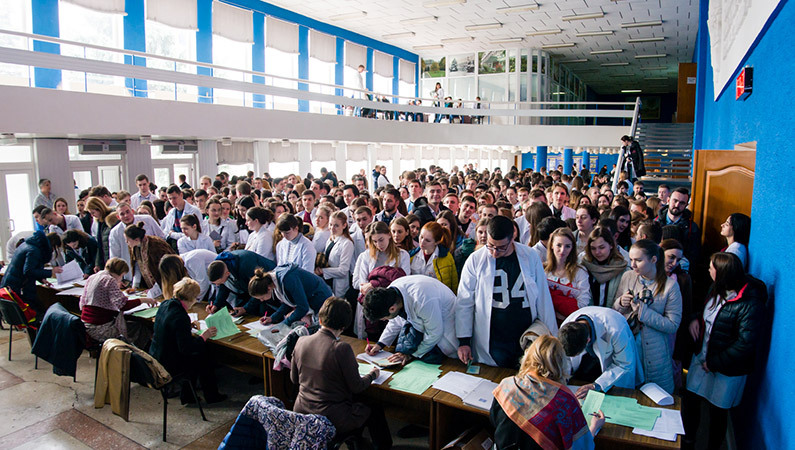 Today, according to the order of the Ministry of Health, Zaporizhzhia State Medical University held an international monitoring study for the fourth-year students in specialties "General Medicine" and "Pediatrics". Over 600 students of the Medical Faculties No. 1 and No. 2 participated in this study. The study was held in nine lecture halls under the supervision of the proctors, responsible for conducting the study. The study lasted four hours with the observance of extraordinary security measures with a prior registering procedure of participants. "By initiating the international monitoring study, the Ministry of Health of Ukraine states its goal to compare the levels of student training and establish a "passed / not passed" criterion in similar studies, which will be held in June for the third-year students in specialty "Medicine". That is, the fourth-year students are a category that will determine the success criterion for further courses in passing the Unified State Qualification Examinations, the structure of which this year, except for the KROK licensed exam, include examinations on the basics of medicine and professionally oriented foreign language. The results will be summarized by the National Board of Medical Examiners of the United States (NBME) that developed the study."